I first heard about this book on Pat Sloan’s podcast. She did an interview with Mellisa Corry and they talked about the book. Of course I went to Melissa’s web page, I fell in love with the quilts I saw. There are over 15 projects in the book… one quilt prettier then the next. So I bought it as a birthday gift to myself. Melissa has a modern sensibility for the most part. Most of her quilt are based on tradition but she puts her unique twist on the blocks. Her instructions are pretty clear cut, easy to understand. ( Keep in mind I have not made a quilt from her directions yet.) Many of her quilts seem beginner friendly. She does a lot of strip piecing instead of just sewing patches together. 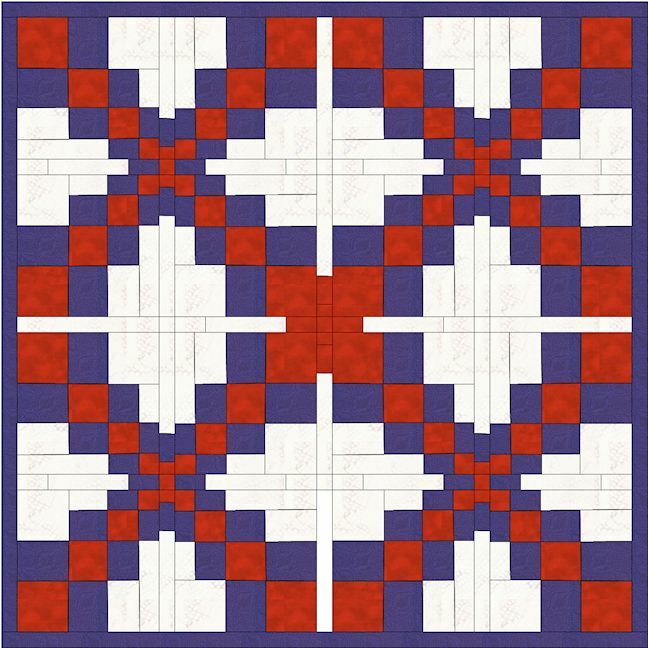 I have never done a strip pieced quilt but I am willing to give it a try. I have heard it is easier than just piecing patches. There are 15 quilts in the book and I would make most of them. I see several that would make really cute baby quilts. The quilt with the little houses in a chain is one of my favorites. You will have to see the book to see the quilt. 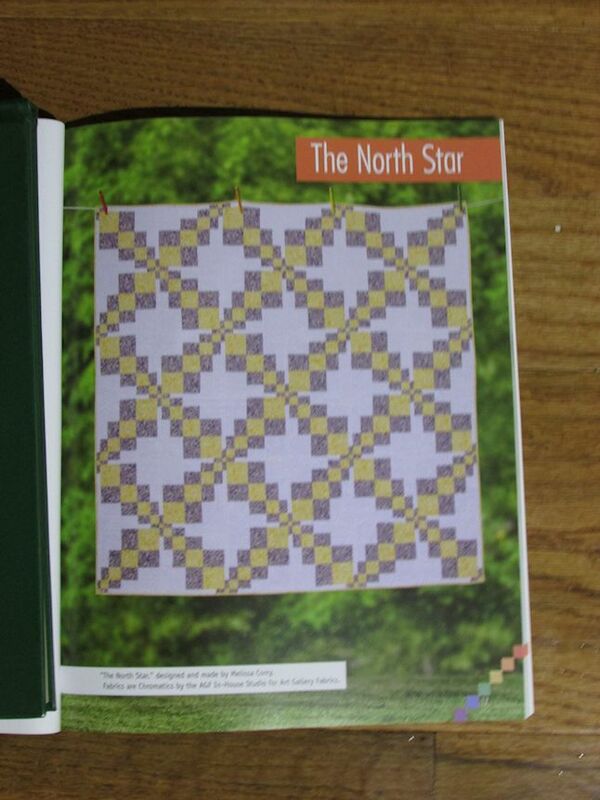 Right now I am planning to make the quilt NORTH STAR … see below a picture from the book and my EQ7 version. I know for sure the red but not sure about the blue as I do not have a large assortment of blue fabrics. ( I am thinking scrappy) Maybe gold would be a better choice than the blue. I think this book is worth the money I spent and am already pulling fabrics from my stash for two of the quilts from the book. < Previous PADS for BRACES . . . . 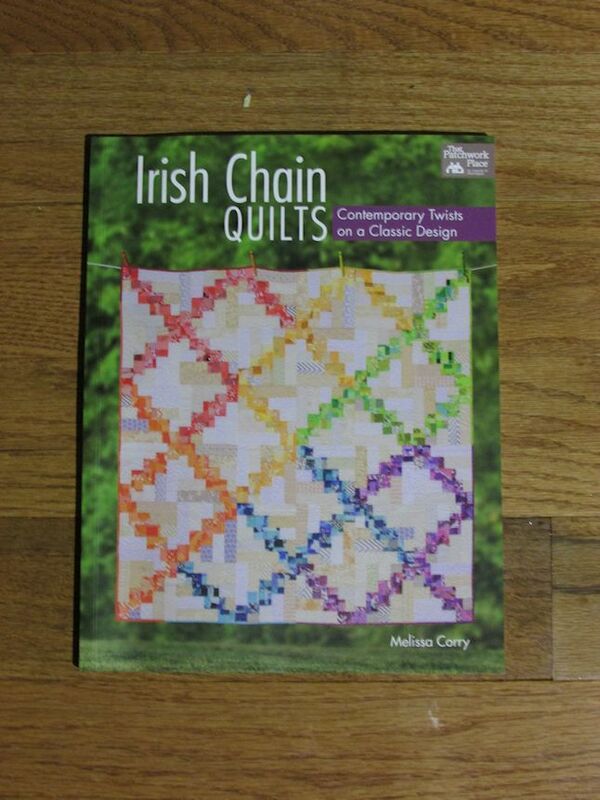 I love Irish chain quilts. I may need to get myself a belated bday present! I THINK you will love the book… I have been keeping it at my bedside so I can look thru it every night. I bet you find tons of quilts to make. Which quilt was your favorite?I liked almost all of them too! It is more … which quilt I did NOT LIKE…. I liked NORTH STAR … but I can not draft it very well in EQ7 … I will use my design wall to lay it out. I also think VILLAGE SQUARE was adorable. I see that one as a long term project of making the little houses as leaders and enders…. one house at a time from scraps…. THINKING .. THINKING… or DREAMING. ….